Delicious, wholesome food is essential to wellbeing. Two chef prepared meals are served daily in the dining room, made with fresh ingredients from local sources. California’s bounty is evident in our menus, re-created to remind of beloved family recipes. Mealtimes in the dining room are social occasions, a time to share good food and conversation with friends and neighbors, and leave the dishes to us. The Staff and neighbors at Roseville Commons invite you to stay for lunch and experience a delicious chef prepared meal. Please enjoy lunch with us by clicking on the “Dine With Us” button. Our one and two bedroom apartment homes feature fully appointed kitchens, so dining in is always an option. Nearby markets and grocery stores make it easy to keep your larder stocked for those times you prefer to enjoy a meal in the privacy of your own home. Roseville’s dining options run from a latte and a croissant at Starbucks, to a thick steak at McCormick & Schick’s in The Fountains or a slice of pie at Cheesecake Factory at The Galleria. Kelli’s Gourmet Cookies or A Slice of Goodness Pie Shop puts the cherry on top of any afternoon outing. 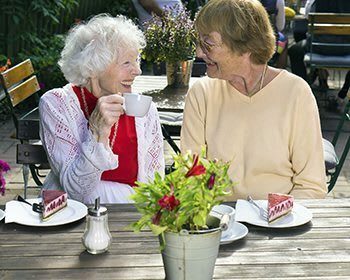 Dessert is always on the menu at Roseville Senior Living. Guilt-free low- and no sugar options make it hard to refuse a little sweetness. Come for a tour, stay for the pie. We look forward to sharing the best of Placer County senior living with you. Please join us in welcoming Patrick Clifford to our community as the new General Manager and Executive Chef. Previously, Patrick was the Executive Chef and Manager at our sister community, Park Place. He has been cooking professionally for over 10 years. He attended Le Cordon Bleu in Boston, Massachusetts. 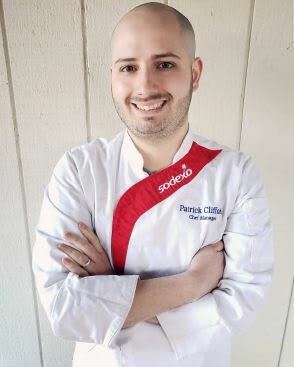 Patrick is well versed in preparing food from scratch, providing healthier versions of our favorite foods and has dedicated his time to improving the quality of life for those he serves. He strives to provide restaurant style service and food with a personal touch.